The stoneware bowl from the Virginia Museum of Fine Arts. Well, there are better ways, actually. But early this year, a Virginia House of Delegates race, which would help determine control of the House, made national news after a tie was decided by a name pulled out of "an artsy bowl," as the Washington Post put it. Indeed the bowl was created by Steven Glass, resident potter at the Virginia Museum of Fine Arts, and it got its own news stories. The rare lottery was broadcast live on CNN and drew a slew of journalists to the state's Patrick Henry Building. Something about the moment seemed to underscore our polarization and just how fragile our democracy has become, as more and more elections seem decided by close splits. Might as well just flip a coin. Or drop your keys in a bowl. Whichever pair you pull out is your date for the evening who's going to screw you out of your hard-earned tax dollars. 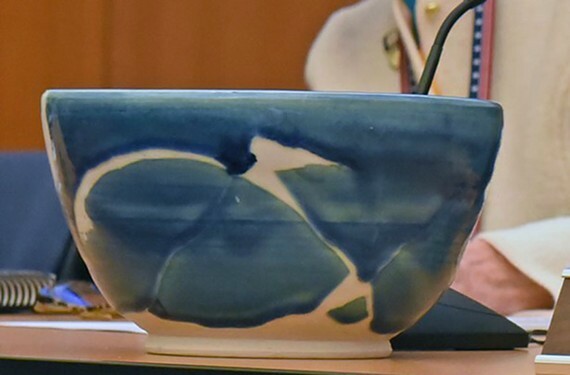 Oh, the Republicans won the seat for the 94th District — as if anybody will remember anything but that big blue artsy bowl.The stoneware bowl from the Virginia Museum of Fine Arts.